Uppercase delivered the best book mail this month! 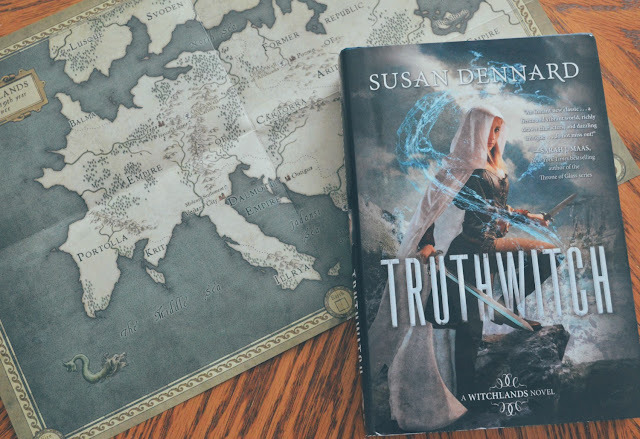 January's book was Truthwitch by Susan Dennard. I was so excited to read this one because it was one of my most anticipated reads for this year! It did not fail to amaze me, I really enjoyed this book. 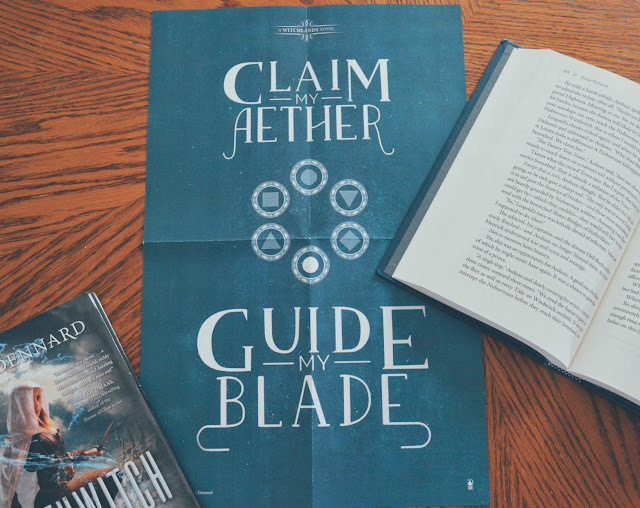 Truthwitch found a brilliant way to bring life to these amazing magical characters set in a very intriguing world! Goodreads Summary // On a continent ruled by three empires, some are born with a "witchery", a magical skill that sets them apart from others. In the Witchlands, there are almost as many types of magic as there are ways to get in trouble - as two desperate young women know all too well. Safiya is a Truthwitch, able to discern truth from lie. It's a powerful magic that many would kill to have on their side, especially amongst the nobility to which Safi was born. So Safi must keep her gift hidden, lest she be used as a pawn in the struggle between empires. Iseult, a Threadwitch, can see the invisible ties that bind and entangle the lives around her - but she cannot see the bonds that touch her own heart. 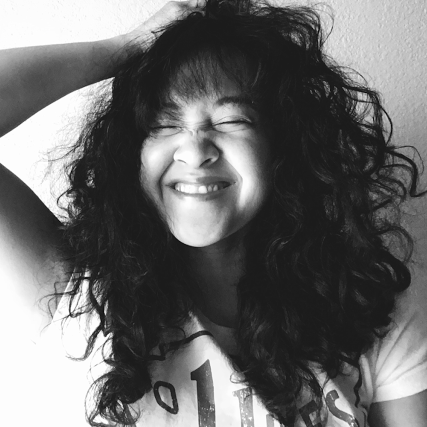 Her unlikely friendship with Safi has taken her from life as an outcast into one of reckless adventure, where she is a cool, wary balance to Safi's hotheaded impulsiveness. Safi and Iseult just want to be free to live their own lives, but war is coming to the Witchlands. 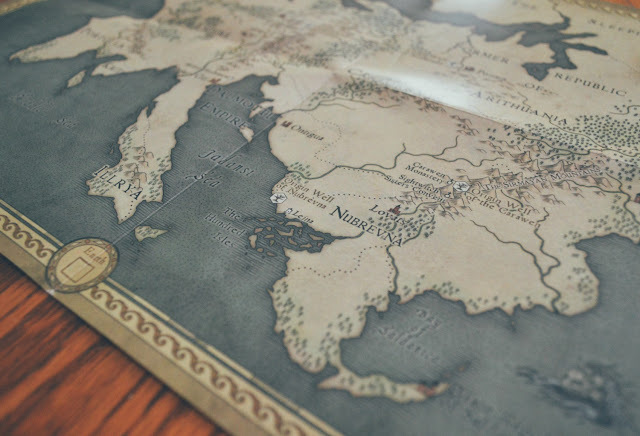 With the help of the cunning Prince Merik (a Windwitch and ship's captain) and the hindrance of a Bloodwitch bent on revenge, the friends must fight emperors, princes, and mercenaries alike, who stop at nothing to get their hands on a Truthwitch. "When the chimes toll midnight, you can do whatever you please and live out the same unambitious existence you've always enjoyed." In all honesty, Truthwitch started off a bit rough for me. We find our heroines of the story, Safiya and Iseult, completely losing all of their earnings thanks to Safi betting all of it on one card game. The action took a backseat to all of the information that was being thrown at us. I found myself learning about all these different types of witches, lots of things about Threads, and feeling very little actual world building. I felt confused and bored. I didn't know what was important to remember, and I wasn't sure why I needed to know all of this right now. The story starts to pick up though, after Safi and Iseult begin their plan to run away from Venaza City to escape the Bloodwitch that is hunting them down. This Bloodwitch is from what they explain as the Void, and is meant to be evil - a demon. Let me tell you my thoughts on this Bloodwitch though, who's name is Aeduan, because I absolutely love him. There is something about him that makes you believe that this guy isn't pure evil. "Aeduan didn't know to whom he owed his loyalty - his vows or his family - yet he was at least certain of one thing: he was grateful the Well had saved Monk Evrane." Everything about Aeduan continued to surprise me! He has so many layers to him that I constantly found myself asking - is he evil? Is he good? I don't know, but I'm a sucker for characters who have a justified past that has turned them into who they are now, but still have a good heart somewhere in them to hopefully be redeemed. After Dennard gets most of the terms out of the way, that is when the story really begins. It's not that I didn't appreciate learning about all the different witches and how their magic works, I just felt like I didn't need to know it all at the beginning. It would've worked better for me if the terminology was spread out throughout the book when necessary. 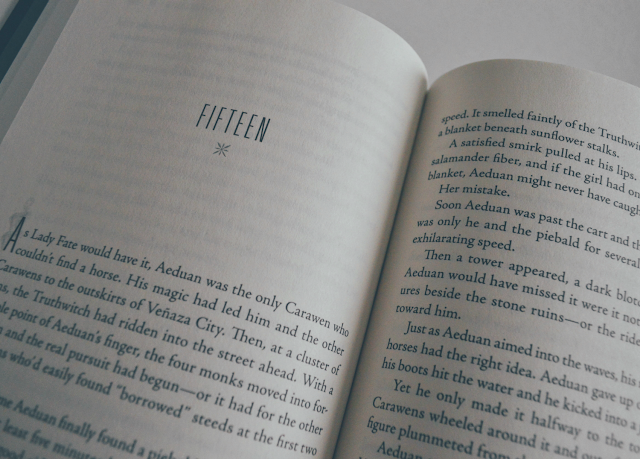 There is a lot that happens after Safi and Iseult begin their escape from the Bloodwitch - so much, that I won't talk about it all because of spoilers and it's a lot of fun to read the twists as they come! I easily fell in love with both Safi and Iseult, who are strong heroines on their own and even stronger together. Safi is reckless and Iseult likes to strategize. They are both determined, loyal, and lethal. They were the perfect pair for an epic team throughout the whole story, even though they both had separate plot points that made them interesting alone. Every character in the story seemed to have their own plot points, yet they all intertwined nicely to bring the story full circle. All of the characters, even the supporting characters, progress the story along. We are soon introduced to Prince Merik who is absolutely swoon-worthy. He was just a good person who would do absolutely anything to help his people. The thing I liked best about his plot intertwining with Safi's was the fact that their romance never took over the story. A lot of people seem to not like their 'insta-love' connection, but I honestly didn't mind it in Truthwitch because they were purely attracted to one another at first, and then it grew to more.. Isn't that how it works out sometimes? "The Threads over Safi's - and Merik's heads - throbbed with a harsh, urgent need. Safi's Threads grabbed for Merik's, and his wrapped and twined into hers." "A storm's coming, Saf, and you're at its eye. I can be the right hand and you can be the left." 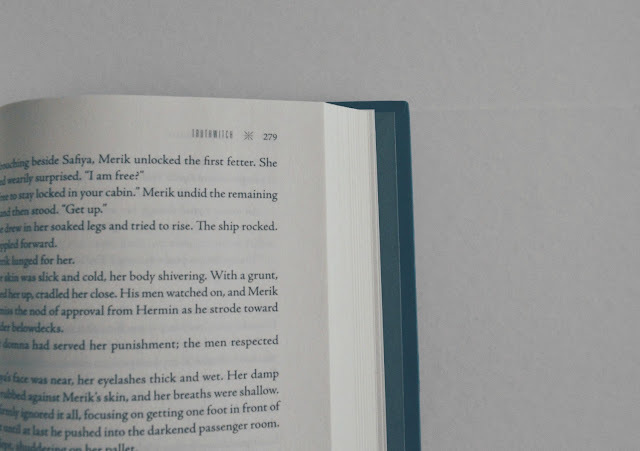 The story comes to an epic ending, and I couldn't stop turning the pages! Susan Dennard is a brilliant writer, and I really enjoyed her style. Truthwitch had a lot of qualities that I've seen in other fantasy reads yet it still had a unique layer to it. Even though the beginning was a bit rough for me, I thought she wrote great dialogue and descriptions to help build this fun world. The story ended with a lot of hope for a strong sequel. I can already tell this is going to be a great series, and I can't wait to read all of it! "I'll always follow you, Safi, and you'll always follow me. Threadsisters to the end." The strongest element to this story was the bond between Safi and Iseult. Honestly I don't see enough girls fighting together in YA books. Their friendship was beautiful, and I loved how they would do absolutely everything in their power to keep one another alive. They put each other first, just like real sisters, and I loved them for it. Overall, I really enjoyed this book. After you get pass the first couple of chapters this story is completely worth reading. I loved this world and the characters inside of it. It had all of my favorite elements of a great fantasy read, and it definitely lived up to the hype for me. I would recommend this book to anyone who enjoys fantasy stories, or is looking for a fun adventure! "She had a prize now. She ran for Nubrevna. She ran for Merik. She ran for Iseult. She ran for Kullen and Ryber and Mathew and Habim, and above all, she ran for herself." 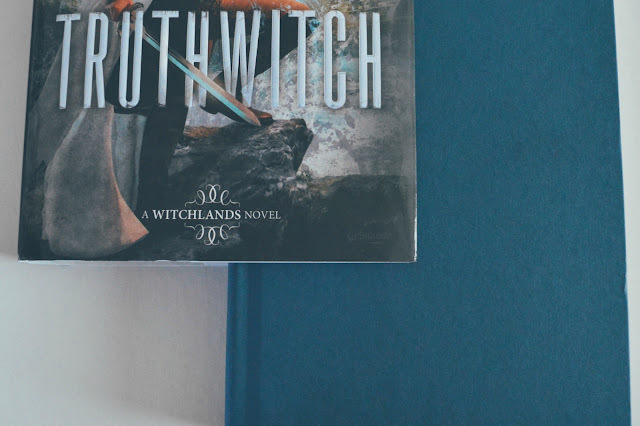 Have you read Truthwitch? Leave me a comment and let me know what you thought!